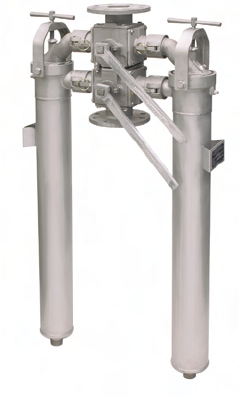 The simple design and quick-element access of the AFC-Series Tubular Backwash Filter can significantly reduce the time and effort required to maintain, change elements and reconnect the unit’s valves. The AFC-Series tubular backwash filter is optimal for applications that demand high-pressure operation, up to 1,000 psi and scalable flexibility. Systems are available in single, duo, and multiplex configurations. Eaton’s Filtration business is a global leader in manufacturing filtration products that include automatic self-cleaning and fabricated pipeline strainers, mechanically cleaned filters and strainers, bag and cartridge filtration systems, and gas/liquid separators for industrial customers worldwide. Eaton offers a full line of tubular backwashing solutions to meet your specific application demands and business needs.